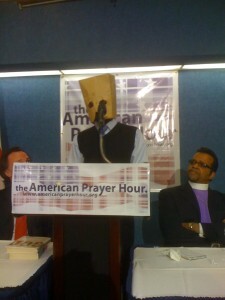 In February, a brave gay Ugandan man living in exile appeared at the National Press Club in Washington with a paper bag over his head to denounce Uganda’s draconian Anti-Homosexuality Bill. He wore the mask to conceal his identity because he feared for his life. Today, Kushaba Moses Mworeko took off his mask to urge the African Anglican Bishops at the All African Bishops Conference in Entebbe to speak out against Uganda’s “Kill the Gays Bill” and other forms of anti-gay discrimination on the continent. 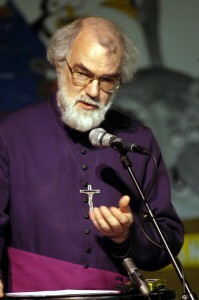 The Archbishop of Canterbury, Dr. Rowan Williams, (pictured) spoke at the event, but has yet to effectively use his bully pulpit to shape a more accepting environment towards LGBT people in Africa. In a new Youtube video, Mworeko sent a message of perseverance and hope to his LGBT brothers and sisters still living in Uganda. Truth Wins Out is a non-profit organization that fights anti-gay religious extremism. TWO’s goal is to create a world where lesbian, gay, bisexual and transgender people can live openly, honestly and true to themselves.